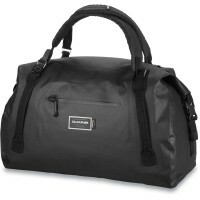 Dakine Cyclone 60L duffle is a waterproof travel and sports bag from durable Cordura ripstop material. The perfect choice if you are looking for a practical duffle for Surf Travel , so some will also take part on the way to surfing. Since it has a waterproof outer layer You can use them both in the boat and in the back of your pick-up trucks to transport because it rains nothing makes itself. The lid of the Dakine bag is simply curled up and closed . Thanks to innovative technology Fidlock® your things are now stored more securely! Rest closures close by the mutually attracting magnets almost by itself, then raced but mechanically and are reliably closed . Thus, the terms are protected from nimble-fingered. Cool is also the proven valve to inflate or compressing the bag . So you save space and can store your surfing and Kitesachen convenient and secure. For transporting simply attach the removable padded shoulder straps and Dakine Duffle Cycle marked on the back. Alternatively you take the padded handles , which allow you to carry the robust backpack bag as well. Customer evaluation for "Dakine Cyclone Duffle 60L Bag Cyclone Arugam"